U.S. border control policy is one of deterrence through death. The U.S. government’s new immigration control measures will push those desperate to come to the United States for work into more dangerous and deadly routes. Meanwhile, U.S. citizens freely cross the border for medical tourism in Mexico. U.S. corporations hire cheap Mexican workers in maquiladora industries and export their products to the United States free of import duties. The U.S. border policy symbolizes the contradictions of the country’s approach to migration. It embodies the inequalities of the relationship between Mexico and the United States. I traveled to the city of Nogales at the U.S.-Mexico border to learn about the lives and experiences of migrants at the center of the national migration debate. An 18-foot tall wall stands between Nogales, Sonora, Mexico and Nogales, Arizona in the United States. It drives a wedge among people who for generations lived as members of a relatively unified border community. 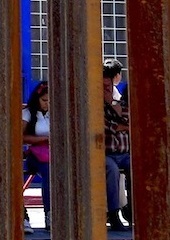 Gazing at the world behind the wall — through the narrow gap between the tall steel posts. 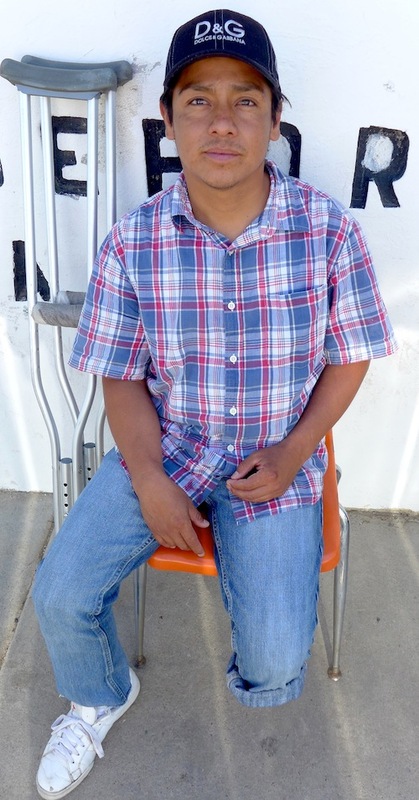 Riding atop a train to the U.S. border, Daniel Toral Merono was attacked by members of a gang. Daniel jumped off the train to escape his assailants. The train ran over his left leg. Daniel’s journey north ended before reaching the formidable obstacles of crossing the desert. Sonora Desert Arizona. With the construction of the wall and the militarization of the border, migrants are increasingly forced to cross the unforgiving Sonora desert. More than 6,000 men, women and children died trying to cross the desert since the construction of the wall in 1994. Deported migrants in a soup kitchen in Nogales Sonora. 1.6 million migrants have been deported during President Obama’s first four years in office. A community housing maquiladora workers and street venders in Nogales, Sonora. A short drive from the wall, U.S.-owned maquiladoras employ Mexican at an average of $10 a day. Proximity to the United States makes Nogales a perfect candidate for export-processing factories. More than 90 maquiladoras hire approximately 25,000 workers, half of the city’s employed population, in Nogales. A group of workers camped outside the factory to protect the abandoned machinery. Legacy Imaging, a maquiladora with headquarters in Denver, made inkjet cartridges for computers for the last 15 years. Reporting for work on a Monday in February, Legacy workers found themselves locked out. The owner had shut down the plant and fled to the United States. Legacy owed its 134 employees thousands of dollars in back pay and severance packages. Selling the factory’s machinery in the market seemed the only way to retrieve some of that money. Many pharmacies in Nogales, Sonora cater to U.S. medical tourists. While the U.S. government has been spending billions of dollars to block the entry of Mexicans, many Americans walk to the pharmacies and dental clinics only a few blocks behind the wall without encountering any U.S. or Mexican passport control. Mexico has turned into a healthcare provider for the citizens of the richest country on earth in recent years. Every year, one million Americans travel to Mexico for medical tourism. Medical tourism is now the number one attraction for the Americans visiting Nogales, Sonora. The shrine of the 16-year old Jose Antonio Rodriguez a few feet behind the wall in Nogales Sonora. On the night of October 10, 2013, the U.S. Border Patrol agents shot Jose Antonio 11 times across the international border. The Border Patrol claims that Jose Antonio was throwing rocks over the fence at agents on the U.S. side. Photographs copyright © 2013 by Behzad Yaghmaian.